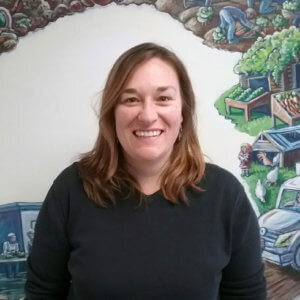 Sarah Waring is Executive Director of the Center for an Agricultural Economy (CAE) based in Hardwick, Vermont. Prior to joining the Center for an Agricultural Economy in February 2013, Waring served as Program Director for the Farm & Wilderness Foundation, Program Director for Vt Council on Rural Development’s Council on the Future of Vermont, and Program Coordinator at the Sonoran Institute in Bozeman, MT. She currently serves on the Boards of the Vermont Community Foundation, Public Assets Institute, and the NEK Collaborative. She has worked in the non-profit world in conservation, land use planning, and rural development, as well as for the Bureau of Land Management in Washington, DC. Born and raised in Glover, Vermont, Sarah earned her B.A. from Haverford College, and her M.A.A. from the University of Maryland. She lives in East Montpelier with her family and cat.